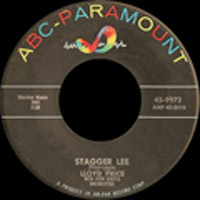 This song was written by Eddie Ray and Rudy Jackson, who was a member of the Jewels, a West Coast gospel and then R&B vocal group, who became The Marbles. They recorded it in 1954.The Charms, an R&B group, had a version in 1954 that went to #1 on the R&B Best Sellers Chart and #15 on the U.S. Pop Chart. It sold more than one million copies and was awarded an RIAA gold record. There have been plenty of covers. The Fontane Sisters had a #1 hit with in 1955. Other versions include those by Eddie Cochran, Red Foley, Elvis Presley, Johnny Preston, Bill Black’s Combo, John Fogerty, and Tommy Sands, to mention a few. Lots of history here! The Charms formed in the early 1950s (and became Otis Williams and The Charms). The other original members were Bob Smith (later replaced by Donald Peak), Rolland Bradley, Joe Penn, and Richard Parker. They had other charting success with “Ling, Ting, Tong,” “Two Hearts,” and “Ivory Tower.” Williams co-produced and arranged Hank Ballard’s version of “The Twist.” He also helped to arrange Little Willie John’s “Fever.” Williams was drafted in 1960, and the group broke up. He performed solo and with other groups over the years. Please click here for the Daily Doo Wop YouTube channel, to which you can subscribe. Thank you for stopping by The Daily Doo Wop. 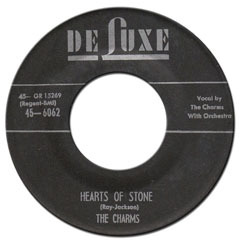 Hope you enjoyed “Hearts of Stone” by The Charms.